Now's the time to automate those tasks currently being performed manually. By combining our MD-2 Step Motor Systems with our XY positioner and a gantry stand, a complete robotic workcell can be created. Our Z-2 Positioner is added to create a third axis of motion. In many cases, an XYZ robotic workcell can replace a very elaborate robotic system at a fraction of the cost. Just connect to your personal computer, attach tooling, and program a sequence. 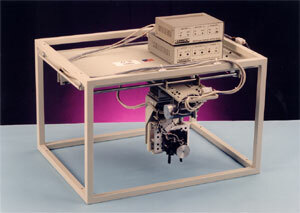 Robotic workcell packages come complete with motor control systems, positioners, hardware and an accessory kit which includes cables, cable mounting hardware, and hand tools. Attach your tooling (may require custom made hardware). Program the desired motion sequences. Ground shipping is approximately $100 in the continental US.